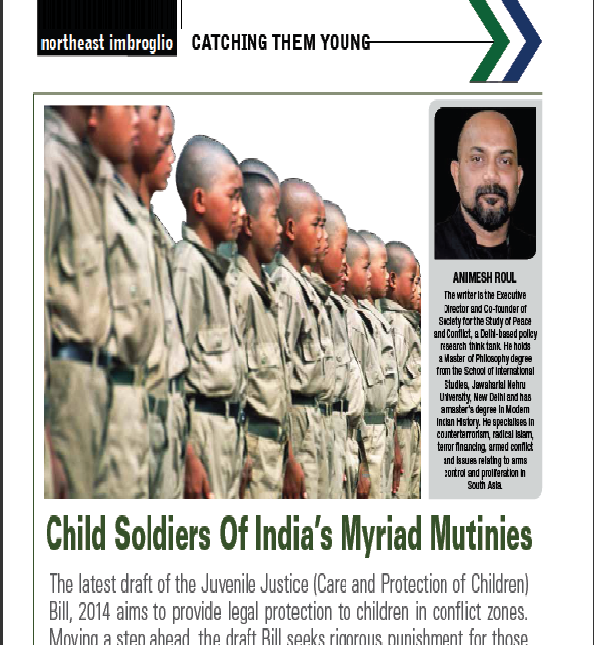 Animesh Roul (SSPC, Executive Director) "Child Soldiers Of India’s Myriad Mutinies", | DEFENCE AND SECURITY ALERT, November 2014. The issue of children engaged in armed conflict has often caught the attention of academics, policy-makers and rights advocacy groups around the world. Ironically, however, it has completely escaped the same attention of the government agencies in terms of formulating legislations or policies which could end or at least control this dangerous phenomenon. India is a case in point. While most of the discourses on children in armed conflict fall in the African war zones, Latin American drug and guerrilla wars and Asia’s Maoist and Tamil insurgencies, child soldiers of India’s myriad mutinies remain either overlooked or ignored. India’s neighbouring countries where child soldiering in the past was ‘painted’ as a voluntary form of service, especially in Nepal and Sri Lanka, in the neighbouring Myanmar, forced conscription of children is prevalent even today. DEFENCE AND SECURITY ALERT, November 2014.